Cold places that are great to visit, have fun when it's freezing! When it comes to holidays, many people plump for sun, sea and sand but there are many locations around the world which are worth a visit, even though the temperature may be slightly chillier. Here’s a guide to some of the less-than-balmy places that might make a refreshing alternative for an enjoyable getaway. The snow-covered land and imposing glaciers may conjure up images of intrepid explorers rather than holidaymakers, but the frozen landscape is rapidly growing in popularity as a tourist destination. The best way to get the most from the experience is to visit via cruise ship; the specially equipped vessels glide through the ice, allowing you an up close and personal look at the wild-life that thrives in the cold temperatures. Depending on when you travel, you could expect to see penguins, seals, sea-bird colonies and whales. Expeditions take place during the Antarctic ‘summer’ which lasts between November and March, when there is more than 20 hours sunlight each day. However, don’t be fooled into complacency by the season, the temperatures are still biting and any trips may quickly have to be scrapped due to changing weather conditions. A desolate and beautiful location, ideal for the slightly more adventurous holidaymaker. For holidaymakers who have a preference for chillier temperatures, the Swedish village of Jukkasjarvi could provide something to tell the grandchildren about. Lying 321 metres in elevation, the tiny village is famous all over the world for its ice-hotel, a truly innovative structure that has to be painstakingly rebuilt every winter. Made from blocks of ice taken from the nearby Torne River, every last detail is sculpted from frozen water, from the walls to the furniture – even the glasses in the bar are made from ice! The ice-hotel in Jukkasjarvi is the largest in the world and is open for day-visitors until 6pm. However, those with a hardy tolerance can opt to stay the night in one of the rooms where temperatures are colder than you can possibly imagine. The hotel equips overnight guests with warm clothing to sleep in, together with sheets and sleeping bags to go over the reindeer skin in the room. Normal clothes must be left at reception – lockers provided – as the overnight temperature in the room would cause them to freeze. In the morning, a much-needed warm drink is brought to each guest and a complimentary sauna is provided. 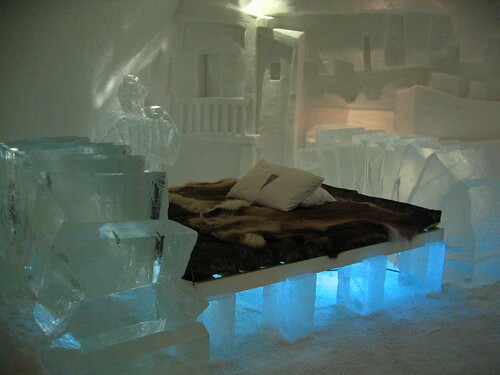 All the creature comforts in Sweden’s ice-hotel – just don’t forget to bring your long-johns and a hat! No guide to cold holiday destinations would be complete without a mention of the Aurora Borealis, the Northern Lights. Alaska offers visitors the ideal chance to view the magical natural phenomenon, and whilst it is present all year round, the constant daylight during the summer makes it impossible to spot. Experts recommend visiting between October and April, with February-March providing the best opportunities to see the sparkling and eerie lights at their best. Alaska has many other things to offer visitors, including 15 national parks and a whole host of wildlife include moose, bears, caribou, whales, sea lions and otters. In the skies, bald eagles can often be seen soaring over the cliffs. Whilst there are lots of self-drive holidays available, a trip by rail-road provides the best views of the countryside and resident animals. The crazy disco-lights of the Aurora Borealis streaming across the sky in Alaska. Whilst not a mainstream holiday destination, getting the necessary paperwork to enter Tibet is like arriving in a secret corner of the world. The country is perhaps best known for the exiled Dalai Lama and the Potala Palace, the former residence of the Buddhist leader, is still a major draw for crowds. However, Yangbajing, a lush green oasis sitting up high close to the snowy Nyainqen-tanggula Mountain range, offers a tantalising combination of freezing temperatures and hot steam springs. Renowned for acting as a cure too many ails; visitors can soak their chilly bones in the hot waters whilst enjoying an unparalleled view of the breathtaking scenery. There’s no denying that a little bit of sunshine can make you feel great but there are many places all over the world with less tropical temperatures that have a lot to offer. Visiting the depths of the Antarctic or staying in an ice-hotel might not be something you want to do every year, but it might make the British summer feel rather less chilly on your return! Image Credits: charley1965 and dihlie…..